The Kohler Corbelle K-3814 is another class toilet from the Kohler brand. When choosing a new toilet, people either have a design in their head or they want inspiration to find the perfect toilet for their bathroom. 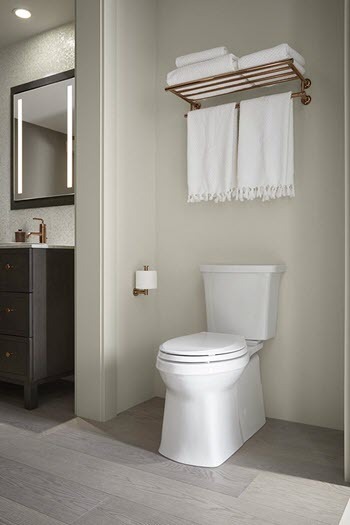 Fortunately, Kohler has a wide range of styles to choose from, so you should have no problem finding the ideal toilet to match your bathroom decor. Kohler is one of the best toilet manufacturers in the market, so each toilet will not only look great but will perform at a very high standard. To help you decide whether this model is right for you, I hope this Kohler Corbelle toilet review will assist your decision. Without further ado, lets have a look at the Kohler Corbelle. For me, there is one striking difference between this toilet and other Kohler models. It is the thickness of the base. Yes, unlike many other toilets that focus on the tank design, the Kohler Corbelle is ‘all about the base’. The toilet base is very solid looking and is almost the same width as the bowl. In fact, there isn’t a big difference in width between the tank, bowl and base. Also, the base is very smooth. There are no designs on the side, just as smooth and minimal as the front. Now, I must say I quite like this. Sure, it is nice to have a little design on the front and sides, however, this smooth, minimalist style looks good to me. Also, a smooth base has one big bonus. A smooth base is very easy to keep clean. Just a quick wipe with a damp cloth every now and again will help keep this toilet looking clean. The Kohler Corbelle is also a Comfort Height toilet. From floor to seat it will measure over 17″, around 2″ taller than a standard toilet. This makes it ADA Compliant and suitable for a wide range of users. Comfort Height toilets are excellent for the elderly, disabled and anyone that finds it difficult to stand up or sit down. It will measure similar to a regular kitchen chair. However, a standard height toilet may be more suitable for small adults and young children. The tank is quite narrow and has a vertical handle lever hanging down on the left side. Also, this toilet is a two-piece, with an elongated bowl. Two-piece toilets are easier to install, however they need a little bit more maintenance to clean, due to the accumulation of dirt in the gap between the tank and base. Two-piece toilets are also generally cheaper than one-piece toilets. Finally, the elongated bowl is roughly 2″ longer than a round bowl, providing more comfort for most users. It is also worth noting that an elongated toilet will take up more space than a round bowl, so may not be ideal for tiny bathrooms. The Corbelle uses Kohler’s very own AquaPiston Tecnology to provide a 360° flush that will thoroughly clean the whole bowl. Not only that but the AquaPiston canistor has 90% less seal material exposed (compared to a 3″ flapper), and provides a leak-free performance. This toilet is WaterSense Certified and only uses 1.28 lbs per flush. A modern 1.6 gallons per flush toilet uses 20% more water than the Corbelle. However, if you are upgrading from a standard toilet that uses 3.5 GPF, then you can make some serious savings (16,500 gallons of water per year). A WaterSense Ceritified toilet is not only great for the environment but it is also a great money saver on water bills. A 360° flush for a thorough bowl cleanse, each and every time. Also, the Kohler Corbelle is WaterSense Certified, only using 1.28 GPF. Installing a toilet is not difficult and most people should be able to install the toilet themselves. However, Kohler have just made the whole process that little bit easier. Kohler have designed their very own patented ReadyLock System. The skirted trapway easily installs to the flange and then attaches to the toilet. No drilling of holes are necessary and it is a very secure installation. Kohler have really raised the bar with the ReadyLock Installation System. The only issue you may have installing your own toilet is lifting it into place. A two-piece toilet has two separate parts, so the Corbelle will be lighter and easier to install. The Kohler Corbelle has quite a distinctive look, so it wasn’t easy to find a toilet that had a similar design and performance. However, I did find a toilet with a similar skirted design and that toilet is the TOTO Vespin II. Let us see how they compare. As described earlier, the Kohler Corbelle has a thick, solid base, that is almost as wide as the bowl and tank. It also has a smooth skirted design on the sides, that makes it very easy to clean and maintain. The Vespin II is not as wide at the base and has a curved front. However, the Vespin II does have smooth skirted sides that are just as easy to clean and maintain. They are both two-piece, elongated toilets and ADA Compliant. The Corbelle has Comfort Height seating, where as the Vespin II has Universal Height seating. This means that they both measure over 17″ from floor to seat (with seat installed). This height is great for tall users, seniors and anyone that finds it hard to use smaller, standard size toilets. Both toilets are easy to clean and are ADA Compliant, with taller, more comfortable seating. The Kohler Corbelle uses AquaPiston Technology to provide an excellent 360° flush, that will clean the full bowl. It is also a leak proof performance, which is great to hear for a two-piece toilet. The Vespin II uses Toto’s Tornado Flushing System , that is also very powerful and efficient. They both are highly water efficient, using only 1.28 GPF. This of course makes them WaterSense Certified. If you are conscious of improving your carbon footprint, then either toilet will be a good choice. Both will also help save money on water bills. The Corbelle and Vespin II are WaterSense Certified, and only use 1.28 GPF. Also, both have powerful and thorough, flushing systems. The installation process is where there is a little bit of a difference. The Kohler Corbelle uses its patented ReadyLock Installation System, that makes the whole process a lot easier. That being said, installing a toilet is not that difficult. The Corbelle is a little easier to install but it won’t be difficult to install the Vespin II either. The Kohler Corbelle is that little bit easier to install, with its ReadyLock Installation System. The Kohler Corbelle and the TOTO Vespin II are similar in look, price and performance. The one difference between the two is the Corbelle installation process is that little bit easier. Both of these toilets perform well, are comfortable and look great. However, if I personally had to choose one on design, then I would choose the Kohler Corbelle. I like the solid square base more. If you would like to see a full review on the TOTO Vespin II toilet, including videos, images and the price, then follow the link. 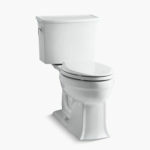 The Kohler Corbelle K-3814 is a really solid and smooth looking toilet, that is also powerful and efficient. Its smooth skirted design makes it easy to clean and Kohler's ReadyLock System makes the installation process a breeze. This toilet is certainly one to consider. 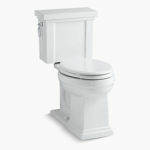 Overall, the Kohler Corbelle is a nice, solid looking toilet that has a powerful, efficient flush. It is WaterSense Certified, has Comfort Height seating and has a ReadyLock System to make the whole installation process even easier than before. Its smooth skirted design not only looks great but it also makes cleaning a whole lot easier. I hope that this Kohler Corbelle toilet review was helpful. If you have used the Corbelle before, was it a good toilet? If you have any further questions on this toilet or any other Kohler models, then leave us a message in the comment section below.